COLD fronts and troughs produced light to moderate falls over southern coastal regions of Australia, while moderate falls were recorded across western Tasmania, due to a series of strong cold fronts and associated low pressure systems. Past seven days: At the start of the week, pre-frontal troughs and cold fronts generated light to moderate showers over coastal South Australia and southwest Victoria, with moderate falls reported over western Tasmania until mid-week due to fronts embedded in a strong west to northwesterly flow. 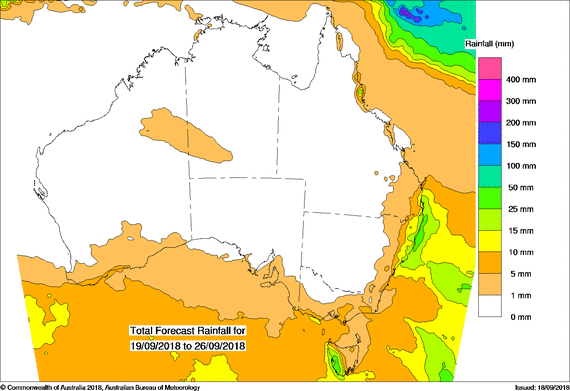 Also during the first part of the week, a surface trough extending through inland Queensland and New South Wales combined with an onshore flow and created isolated thunderstorms and showers along the northeast coast of New South Wales and areas of Queensland’s east coast. Approaching the middle of the week, a cold front extending from a deep low in the Southern Ocean crossed southwest Western Australia, bringing light falls. This front broke up, becoming a complex area of low pressure and fronts as it continued over the Bight and across southern regions of South Australia during the second half of the week, with light falls over southeast South Australia and widespread light to moderate falls recorded over much of the southern half of Victoria. In Tasmania, these systems produced moderate totals over the west of the State. In the north, humid easterly flow and a weak trough triggered showers and produced light falls over the western Top End of the Northern Territory during the middle of the week. At the end of the week a weak cold front extended from southwest Western Australia to south of Tasmania, again bringing light falls to far southwest Western Australia and the west of Tasmania. Rainfall totals exceeding 50 mm were recorded across most of western Tasmania. The highest weekly total was 131 mm at Mount Read in western Tasmania. Rainfall totals of 10 mm to 20 mm were recorded in parts of the southern coast of Western Australia; far southeastern South Australia; from southwestern Victoria to the Otway Ranges and across West and South Gippsland; and across most of the remainder of Tasmania away from the east coast. Totals in some Victorian locations exceeded 25 mm, while isolated locations in east coast Queensland, and northeast and southeast New South Wales also received varied totals up to 30 mm. Little or no rainfall was observed in the majority of Western Australia, the Northern Territory, Queensland, and New South Wales, most of South Australia away from the peninsulas and southeast, and northern Victoria.